Is it that time of year again? The time when it becomes socially acceptable to start planning for Passover? My, how time flies. Our Passover is likely to be a particularly hectic one, since we’ll be spending it in a new apartment. After 6-plus years in our little Tel Aviv apartment, we’re moving to one that’s significantly larger. First into boxes was my massive collection of plates and pottery. Since, to be honest, I don’t really need to have 4 different sets of plates and 20 serving bowls on hand at any point in time. I’d say this might crimp my blogging style, but then again, so do having a baby and a job. Either way, spring is in the air, and vibrant green vegetables like asparagus and fennel are appearing in the markets. 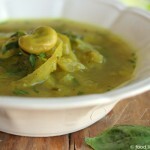 This fragrant vegetable soup was part of our little seder last year. When I say little, I mean it — me, my husband and my 9-month pregnant belly. We read the Haggadah, filled up on appetizers and then fell asleep on the couch. Four cups of wine? Ha, who needs it? Yet we managed to have hefty bowlfuls of this lovely soup before passing out. This soup works just fine without the accompanying matzo balls, though it is more filling if you add them. Chop the onion, zucchini, fennel, carrot and celery into large chunks, and fry gently in a large pot with some oil on a medium flame. Chop up the garlic and Jerusalem artichoke and add as well. Peel or chop off any tough bits from the base of the asparagus’ stems, and add alongside the water/broth, bay leaves, salt, turmeric and pepper. Simmer gently until the vegetables are just soft enough to eat. Mix together all the ingredients, and let sit for a few minutes so that the matzo meal absorbs the liquid. Bring a pot of water to boil on a medium-high flame. Using a spoon or wet hands, shape the mix into balls and drop into the boiling water. Let boil until the matzo balls fluff up and float. Remove them from the water and serve with the soup. 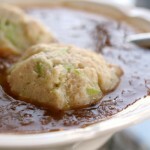 4 Responses to "Springtime matzo ball broth"
I am not crazy for matzo ball soup but I think I would like yours…. Soup on the picture looks marvelous. Good luc on the moving! 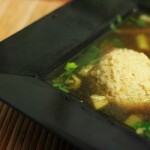 Oh, I’ve been looking for a good vegetarian matzah ball soup recipe, so this is very welcome in my news feed! Thanks, and enjoy your new space! 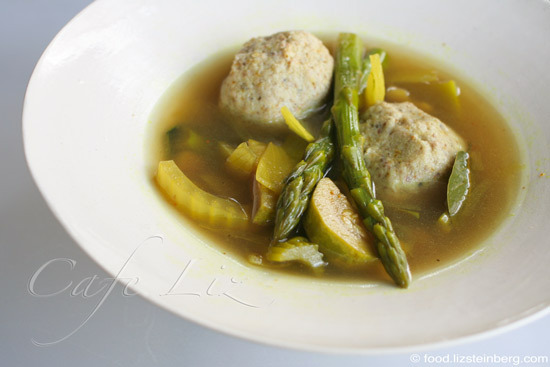 Love your take on a clear veg broth for Pesach. So green and spring-y! Almost Hag Sameah from another blogging Liz!